Sony has added a third RX to the lineup (okay, technically with the RX100II and RX1R upgrades, this new offering makes five): the US$1300 RX10. The RX10 isn't quite what everyone expected it to be, which is a little strange. Sony seems to be trying to fill every gap in their lineup, so with an RX1 that was full frame and an RX100 that was 1" sensor, everyone guessed that the RX10 would be, tah-dah, APS. Nope. It's 1", like the RX100, but with an EVF. Okay, so now we have another strange naming pattern to contend with. Tell me, Japan, are there any marketing departments over there that actually can come up with logical and compelling product names that don't confuse consumers? Bueller-san? 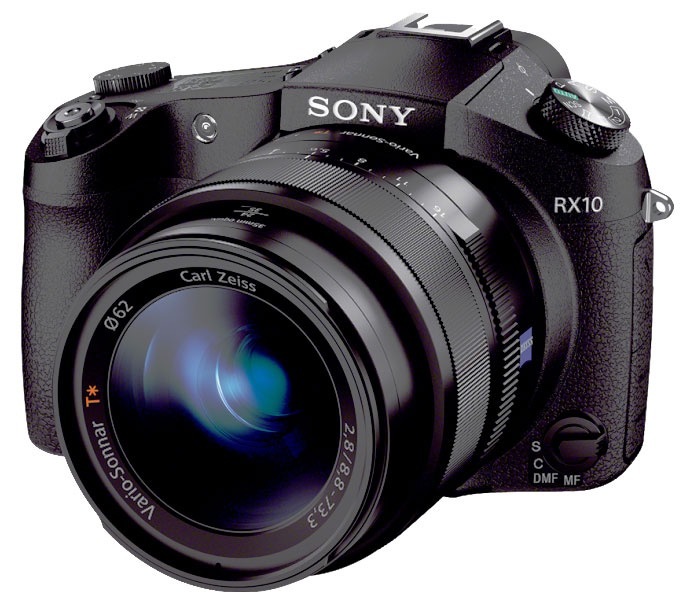 Besides the 1" sensor, the RX10 has a 24-200mm f/2.8 (equivalent) zoom and XGA-sized electronic viewfinder. By comparison, the RX100 has a 28-100mm f/1.8-4.9 zoom and always uses the LCD for composition. Hmm. More strangeness. So the old camera is about a stop faster at 28mm and the new camera is about a stop faster at 100mm (and goes to 24 or 200). Thus, for US$550 more, you get that weird lens differential plus an EVF. Don't get me wrong, I love the idea of getting a 24-200 on this little powerhouse of a camera, and I'm glad that Sony's putting more design effort into the RX line, but I'm having a little trouble figuring out exactly where Sony thinks they're going here. The RX line now consists of compact camera types (RX1, RX100) and something more like a bridge camera (DSLR-like compact, the RX10). It's nice to have choice, but Sony now has so much confusing and overlapping choice that they risk not making the right sale to the right customer. The RX10 feels a little too much like "hey the RX100 was a hit, can we make another camera quickly using most of those parts that has enough differentiation that it looks like a different camera?" What that turned out to be is a much larger camera that has DSLR-like aspirations, but also suffers from a fairly large lens sitting out front. This isn't a pocket camera, so it's yet another of the choices you'd make to carry around your neck. I believe the only reason you'd choose the RX10 is because of the lens. Why? Because Sony themselves make a better choice that has interchangeable lenses: the NEX series (oops, NEX is now a no-no in Sony marketing, though they haven't yet caught their product names up to their marketing message). Bigger sensor, faster focus (on say the NEX-6), lens choice (though no 24-200mm f/2.8, which is why I say the lens is the definer for the RX10). Be careful with using these 35mm equivalents when comparing lenses. As I note in "Pick a Size" on sansmirror.com, true equivalency is a little more complicated. That f/2.8 on a 1" sensor is actually about the same as f/5.6 on an APS sensor. So that NEX-6 with the collapsing 16-50mm f/3.5-5.6 lens (24-75mm equivalent) isn't looking quite so bad, is it? I like this little RX, though. It actually may be the sleeper in the lineup, though at the US$1300 price it's going to disqualify a lot of folk right out of the box (that NEX-6 with the 16-50mm is only US$800). Still, the RX10 looks like a near perfect lens for walking around the streets of Paris or Rome or virtually any other travel photography where you need some versatility but want to keep things light and small.